One of the most noteworthy features of the Huawei Ascend Mate2 4G is its beefy 3,990 mAh battery. The Chinese manufacturer boasts that the phablet has battery big enough to charge other phones too via a dedicated cable. The current champion of our battery test, Nokia Lumia 1520 managed achieved the whopping endurance rating of 107h with a 3,400 mAh battery and more demanding hardware on board. As a result, our expectations towards the Huawei Ascend Mate2 4G are quite high. The phablet started off in an assertive fashion by making it through more than 33 hours of talk time before its massive battery called it quits. Its result is the best of any handset we’ve tested this far – it tops the second best Nokia Lumia 625 by more than two hours. 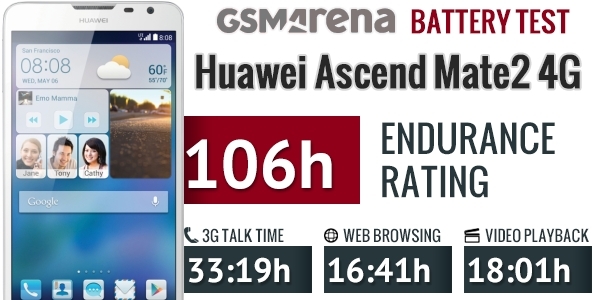 Huawei Ascend Mate2 4G continued to impress in the web browsing section of our battery test as well. With 16 hours and 41 minutes of continuous surfing, the phablet topped the Sony Xperia C and Nokia Lumia 1520 by a cool four hours, thus leaving no doubts about its supremacy. In the video playback section of our trial, the Huawei Ascend Mate2 4G placed second behind the LG G Flex with 18 hours of playback. The Korean phablet royalty retained its top spot because of its P-OLED display and similarly sized battery unit. 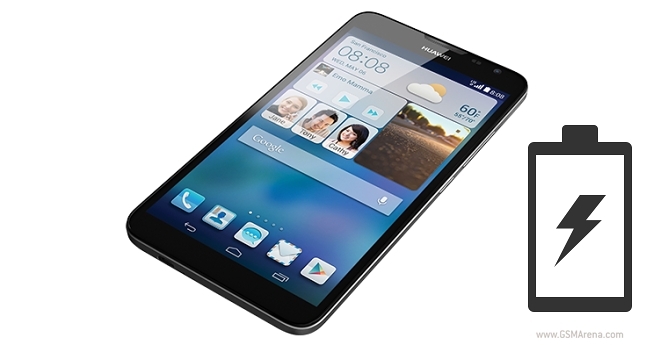 After setting most of the competition on fire during the individual battery tests, the Huawei Ascend Mate 4G clocked in the impressive endurance rating of 106 hours, thus meaning that the phablets will coast through well over four days of usage if you utilize it for an hour each of telephony, video playback, and web browsing. The Chinese entry came just short of Nokia Lumia 1520’s endurance rating of 107 hours. However, it is worth pointing that the Ascend Mate2 4G bested the Microsoft royalty on all individual tests – its slightly inferior standby power consumption prevented it from taking the crown home . It is also considerably cheaper than the Nokia handset. You can find out all about out battery test results in our dedicated tool over here.